Chameleon Cold Brew Coffee is a concentrated cold brew coffee beverage that has been cold brewed for 16 hours. The brand has recently been bought by Nestle. Chameleon Cold Brew suggests consuming their product in a 6 fl oz serving diluted with at least 6 fl oz water or beverage of your choice. Chameleon is also available in Ready To Drink bottles. Each 10 fl oz bottle contains one serving of their cold brew for a total of 230 mg caffeine. Chameleon Cold Brew RTDs are available in Black, Espresso, Vanilla, Mexican, and Mocha. Chameleon also offers a ready-to-drink product that's blended with whole milk. These clock in at 82 mg per serving. Chameleon is unsweetened and is designed to be mixed with the beverage of your choice or for drinking straight. You could mix this coffee concentrate with milk, ice cream, protein shakes, smoothies, and more. Be careful if drinking Chameleon Cold Brew Coffee straight as it contains a lot of caffeine and could quickly put a person over their safe limit. A whole bottle of the 32 fl oz concentrate would contain about 1109 mg of caffeine. Cold brew coffee has been becoming more popular due to its convenience and the rise in popularity of iced coffee. Most brands would contain concentrated caffeine amounts similar to the brand listed above. Kohana Cold Brew: 80mg/ 1 fl. oz. whereas Chameleon has 32mg/ 1 fl. oz. Stumptown Cold Brew: 279 mg per 10.5 fl oz bottle. This isn't a concentrate but an RTD. Many brands don't list their caffeine content but most concentrated versions will be similar. 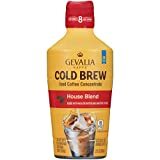 Does Cold Brew have more or less caffeine than traditional hot brewed coffee? The simple answer is more ounce for ounce. The complex answer is as follows: Caffeine is more soluble at higher temperatures, however, to make cold brew coffee a lot more ground coffee is used per water ratio and a longer brew time of about 12+ hours results in a more caffeinated coffee per ounce. Comparison: Chameleon Cold Brew has about 35mg of caffeine per ounce while Starbucks Brewed Coffee has 20.6mg of caffeine per ounce. But, cold brew coffee concentrate is meant to be diluted with water before drinking, so the final caffeine concentration will depend on how much the consumer dilutes the cold brew with ice or water. You can easily make your own cold brew coffee. Here are a few recipes to try on a couple websites. Chameleon Cold Brew Coffee contains 34.67 mgs of caffeine per fluid ounce (117.22mg/100 ml).